Namibia is renowned for its spectacular scenery and landmarks – soaring red dunes, endless rolling gravel plains, ossified trees against cobalt-blue skies and the rusting ribs of shipwrecks jutting out of the Skeleton Coast sands. Add in the truly weird and wonderful wildlife that survives in these sometimes unforgiving, semi-Martian surroundings and you already have a perfect recipe for adventures in Namibia. When you start interacting with the landscape and enjoying some of the more ‘extreme’ activities that Namibia has to offer, the adrenaline really starts to flow, and you can experience the rush of seeking thrills in some of the most exhilarating locations imaginable. 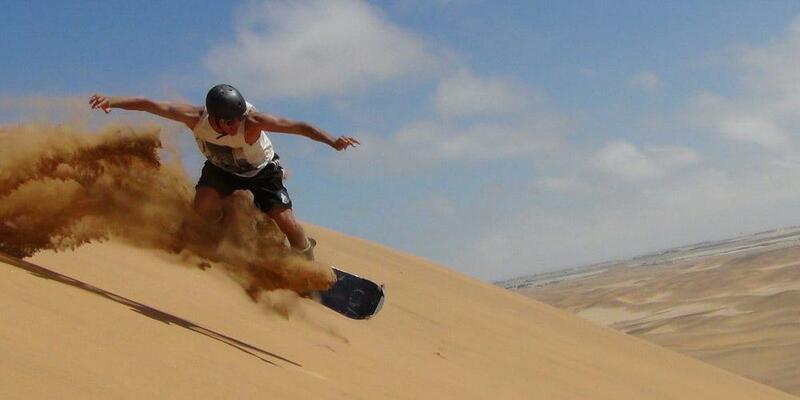 What goes up, must come down – and the hike up the monster dunes just outside of Swakopmund, breaking trail in the orange sand, is very much worth it to experience riding back down at speeds approaching 45mph. If you should take a tumble, fear not – the sand is talcum-powder soft. More experienced snowboarders can glide along standing up, but the lie-down option is just as exciting. The ban on permanent structures in the National Park means there’s no ski-lift to get you back to the top, but with the adrenaline still surging from your last descent, you won’t at all mind the short trek back to the crest of the dune, with the reward being another thrilling race to the bottom. Namibia’s scenery is, if anything, even more breathtaking when seen from above. Floating slowly over the Sesriem Canyon and Sossusvlei in a hot air balloon is the perfect way to appreciate the sinuous curves in the sand, and the ever-changing interplay of light, shadow, and color across the floor of the desert. The adrenaline here comes not from the speed at which you’re moving, but the thrill of seeing these unique landscapes from a bird’s eye perspective. Looking down, you may follow a line of hoofprints in the sand to where a lone oryx antelope is cresting a ridge, or spot the black silhouettes of a long-dead forest as shadows stretch across the surface of a clay pan. The occasional roar of the burners and your own heartbeat will be the only sounds, although you might imagine you hear crashing waves in the distance. 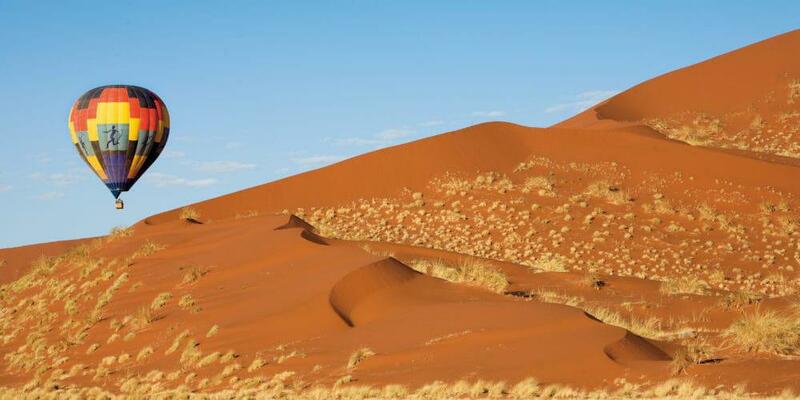 The route to Sossusvlei from Wilderness Safaris’ Kulala Desert Lodge (the lodge with the best access to this iconic location) runs along a natural ‘corridor’ of impressive Namib Desert dunes. One of the most famous of these is Dune 45, so-called because it is 45km (28 miles) along the gravel road. 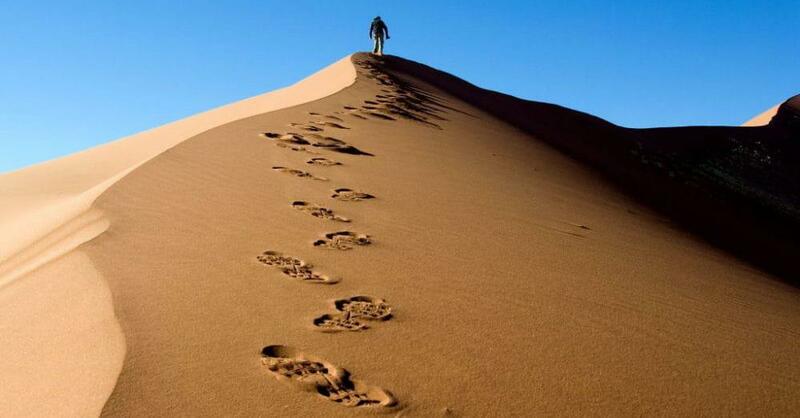 As it’s easy to reach, this 560ft mound of sand is one of the most-climbed in Namibia. Press on, however, and you will reach Big Daddy, almost twice the height – and lots more run to climb and then run, tumble or roll down! Big Daddy overlooks Deadvlei, the view that launched a thousand postcards with its saturated colors and stark beauty. The descent into Deadvlei from Big Daddy gives you time to appreciate the stunning simplicity of this desert scene. Once you’ve got your breath back, take time checking out the black skeletons of the trees as the sun beats down from a pure blue sky and the light bounces off the orange dunes. 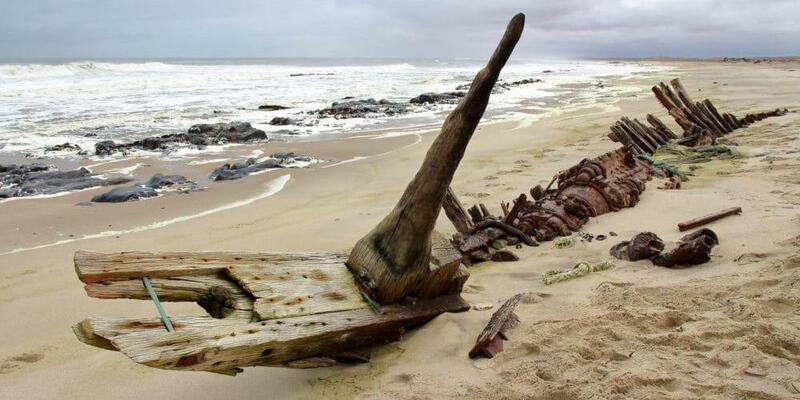 Namibia’s Atlantic Coast can be a desolate-looking place, and its sandy beaches are littered with the bones not just of whales and seals, but also the iron remains of some of the many ships that have foundered there over the years. As the dunes have advanced into the sea, some of the most famous of these spooky shipwrecks now find themselves hundreds of yards from the breakers. Behind these wrecks lie incredible stories of bravery and folly, epic rescues and hidden tragedies. Swooping low along the coast in a light aircraft feels like diving on these wrecks, now reclaimed by seabirds as perches. Keep an eye out too for seal colonies and perhaps even a desert elephant on the beach. No, not a ghost, but one of Namibia’s ultimate survivors – yet another thrill to be experienced in this land of sea and sand. 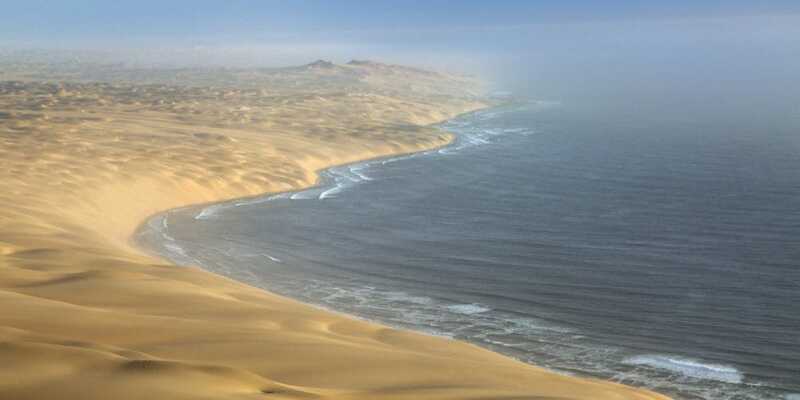 The coastal town of Swakopmund sits between the desert and the cold waters of the Atlantic Ocean. It has a quaint, colonial feel to it, with its cake shops and candy-striped lighthouse – but it is also the undisputed adrenaline capital of Namibia. There are few places in the world where your view as you step out of the light aircraft includes both ocean and desert. Combine this with the awesome sensation of freefall (expertly guided by your instructor; all jumps are in tandem) and you are guaranteed to blast away any cobwebs. The sight of the Namib dunes rushing towards you as you descend contrasts wonderfully with the serenity and silence of the clear blue skies. Back on terra firma having watched the footage of your jump, that first slice of traditional chocolate Sachertorte will taste all the more delicious.